Not a day goes by when I don’t read one of his homespun maxims (from his dad) like “Make each day your masterpiece,” or “What is right is more important than who is right.” I carried that card in my wallet and framed the Pyramid of Success for my office. I felt a personal connection to the greatest basketball coach of all-time. As a kid born in Brooklyn, NY, I thank my parents for raising me with good values. 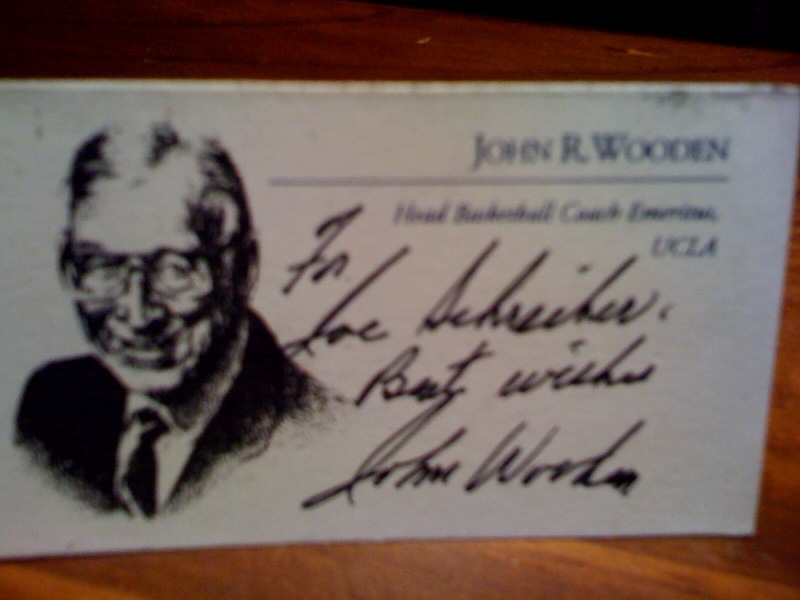 I also thank John Wooden for the humble small town midwestern values he brought to me. My late father’s lasting impact on me was as a loyal husband and father. John Wooden honored his late wife Nellie every day after her passing in 1985. We live in tumultuous times, and it’s the values and principles that John Wooden teaches that gives us an anchor, an ability to stay centered, should we choose to live by his teachings. I’m taking the time to write about my first trip to NAB Show – (The National Association of Broadcasters Show) not as a self-indulgent rant about a trip to Las Vegas, but rather an educational journey that I realized that is of value to not only broadcasters, but every business with a PR and marketing strategy. NAB Show has evolved to become a resource for high-level insight, training, education and state-of-the-art technology powering the future of content creation, management, commerce and delivery. One of the reasons that I did not attend NAB in recent years is because I thought the show was mostly a showcase for new video and audio equipment. While there are over 1500 exhibitors on hand, I learned that this year, I couldn’t afford NOT to attend the conferences. A former NBC colleague of mine, Anna Davalos MacDonald, now Executive Producer, Clean Skies News, informed me about the Broader-casting conference. NAB defines “Broader-casting” as: “The creation, management, buying/selling, distribution and delivery of audio, video and filmed content for global consumption on any device — stationary or mobile — including television, computer, movie screen, radio, phone, gaming console, storage, digital display and beyond.” Since we are now living in the day and age when EVERY business is empowered to broadcast their own story, understanding the scope and power of “Broader-casting” is essential to developing a strategy for all of our clients in the business and broadcasting world. I will devote a series of blog posts to what I learned at NAB, and how it can be of value to broadcasters and any business. While working for NBC and The George Michael Sports Machine, I had the privilege of covering 23 Super Bowls. My four days at NAB felt like a Super Bowl. There were over 82,000 attendees overall, with a large portion of that number scattered through exhibits and conferences throughout the Las Vegas Convention Center and Hilton Hotel. The biggest “eye-candy” was 3D Television. Our company, MATTMAR PRODUCTIONS, prides itself on the “MATTMAR ADVANTAGE” – We’re a small firm experienced in delivering content with global impact without the burden of excessive overhead and antiquated technology. We have many questions about 3D. How expensive is it? Is it cost prohibitive? Is it a gimmick? Will it explode or land in a nitche market? How long will it take for the prices to come down for 3D televisions? Who can afford the workflow? Are there practical uses for businesses? We had the benefit of being invited to a show of the new Panasonic technology including 3D Television. We sat in a small theatre, put on 3D glasses, and watched a sampling of 3D sports and entertainment. For home entertainment, it was awesome! From confetti flying out of the screen, to ice coming off the skates of hockey players, it truly was a world of wonder to watch. BUT, the average price of a 3D television is about $2800, the 3D Blu-ray players $400, and 3D glasses $150. Obviously, 3D is not in the stage of affordability, and only time will tell when the cost will come down favorably for mass consumption. What about applications for business? For those with deep pockets, a corporate presentation in a small theatre-like setting can be powerful. Our joint venture, AUTHENTIC FILMS, produces reality/documentary series programming for major college sports, and I imagined how wonderful it would be for universities to present our show in 3D in a theatre setting for donors. Panasonic is already making a 3D camcorder for $21,000, making that part of the work flow affordable for smaller production companies. While ESPN plans to roll out a 3D Network this year, most studies show that 3D TV won’t become a big player until later in this decade. At MATTMAR PRODUCTIONS, we will stay tuned to innovative applications of 3D TV for broadcast and business. LISTEN! So many interviewers make the mistake of being consumed with their own questions. Listen to your answers, engage, and follow up. THE FIVE P’S: PROPER PREPARATION PREVENTS POOR PERFORMANCE –Larry King has succeeded by purposely avoiding research and relying on conversation to get his subjects to open up to him. It works for him. But this tactic won’t work for everyone. By doing your research you can choose nuggets of information to strike a nerve and engage your subject. Thanks for paying attention to Mattmarpro – and if you want to the secret of youth, just step out of your comfort zone at least once every day.